Following on from our most popular tutorial on HTML Bullet Points, let’s now have a bit of an easier CSS tutorial on how to format bulleted and numbered lists in CSS. This will lead onto a future tutorial on using <ul> and <ol> to create navigation menus. But as these CSS3 Tutorials assume no prior knowledge, let’s do things one step at a time! As with HTML, you can define an unordered list with a set of basic shapes. At this point it would be helpful for me to point out that the style of bullet point can be set at <ul> and <li> level. This means you can set the same appearance for all bullets in a list or set individual styles per bullet point, if you really want to. 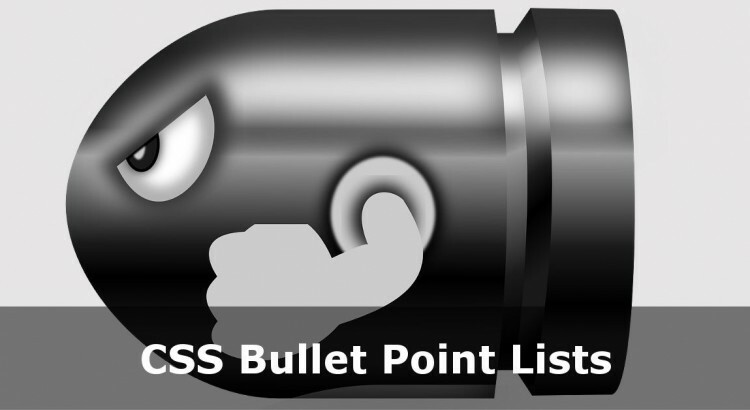 To set the bullet appearance you can use CSS’ list-style or list-style-type. list-style-type is the exact property we are changing here, but you can also use list-style to change multiple properties, which we will come to shortly. You don’t have to remember to set the bullet appearance each time. After the first list you create, subsequent lists use fewer bytes of code, making the page quicker to load. One thing you can’t do easily with HTML alone is create custom bullet points. With Cascading Style Sheets, this is a breeze. Firstly you’ll need to create an image ready. I created a simple 10px × 10px PNG ready for this exercise. When you first create a bullet list in HTML, your browser will assign a padding and margin to both your UL and LI elements. To get full control you are best setting your desired padding and margin straight away. On top of that CSS gives you the list-style-position property. There’s a great demo of this over at CSS Tricks. list-style-property takes two values: inside or outside. You’ll need to play with your code to find the most appropriate setting for your web page. Using a shorthand method in CSS saves you bytes of data, and RSI in typing! If you would rather set each line individually, then feel free. Just know there is a quicker way! It’s probably not a good idea to do what I have done here – that will confuse users. But if you prefer Roman Numerals for your lists, for example, you can do that in CSS. I have created a demo file for you to download showing some of these options. As always if you need any more help then get in touch!